Basements are ideal spaces for home theaters … as long as you can lay out the space without structural columns getting in the way. Is someone in your family a movie buff? Or maybe there are some major sports fans in your house. How about family members who are simply passionate about catching their favorite TV shows? In all of these cases, a home theatre is the ultimate way to indulge in these passions. And many homeowners are discovering that there's no better place than the basement for a home theatre. Why? Well, when you create a home theatre in an upstairs room, you'll inevitably be dealing with existing conditions that can be limiting: windows and doors, electrical outlets that aren't in the right location, unsuitable lighting, and distractions in adjacent rooms. 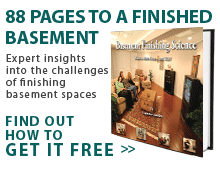 Total Basement Finishing can turn your basement into the perfect location for a home theatre. To discuss home theaters with experienced professionals, contact your local TBF dealer and schedule a free estimate! The basement of your house provides you with a blank slate – the opportunity to design a home theater (or other dream basement) as perfect as you want it to be. Instead of coping with the existing conditions of an upstairs room, you can get the details right the first time when you design a basement home theatre. A big, low-profile, flat-screen TV is the star player in any home theatre. A big, low-profile, flat-screen TV is the star player in any home theatre. With some built-in cabinetry underneath and on either side of the screen, you'll be able to hide the wiring and house associated components like DVR boxes and DVD players. Although the cabinetry can appear to be built in, make sure you have access to wiring in case repairs and replacements are necessary. Basement Home Theater Lighting. Task lighting can often be accomplished with floor or table-mounted lamps. No, the light doesn't need to be bright in a home theatre, but you need to be bright about lighting controls. Put your general or ambient light on a dimmer control so that you can turn the light down while you're watching TV. But make sure you provide task lighting where it counts, so that people can read, eat or use a laptop computer. Task lighting can often be accomplished with floor or table-mounted lamps. For safety and convenience, make sure to light the stairway or the area around a refrigerator, sink or bathroom door. To save on electricity and keep your theatre "green," use low-voltage compact fluorescent lights (CFLs) or LED lights. Instead of carpeting, consider the ThermalDry® flooring tiles available from Total Basement Finishing. It's a safe assumption that people are going to be eating and drinking as they watch TV, so choose finished flooring material that won't be damaged by stains and moisture. Instead of carpeting, consider the ThermalDry® flooring tiles available from Total Basement Finishing. Though this innovative flooring material looks surprising like real wood or tile, it's more durable, stain resistant, waterproof and easier to clean than the material it imitates. Make sure your contractor uses rigid foam insulation rather than fiberglass batts. Many homeowners overlook the importance of including insulation in a basement finishing project. Without it, your new living space won't be as comfortable as you'd like. Make sure your contractor uses rigid foam insulation rather than fiberglass batts. Old-fashioned batt insulation can collect moisture, encourage mold growth, and lose its insulating value. Rigid foam will never suffer from these ailments. Speaking of comfort, it's a good idea to ask your basement finishing contractor about controlling basement humidity with a dehumidifier. This goes without saying. If you've handled all the details explained above, it's time to splurge on some comfortable furniture to maximize your enjoyment of your new home theatre. Ready to get started on your home theatre? Trust the professionals at Total Basement Finishing for a job well done - schedule a free estimate with your local dealer today!